Average Weight	: 12 lbs. Developed as far back as the 19th Century in East Anglia, England, the Norfolk and Norwich Terriers used to be the same breed with two different ear types; both were referred to as the Norwich Terrier. The English were the first to separate them in 1964. In 1979 the AKC officially deemed them as separate breeds, the Norwich having small perked ears and the Norfolk with dropped ears. Another slight difference is the Norfolks are angular in shape and the Norwich Terriers are more round. The dogs were used as barnyard ratters and to bolt foxes that had gone to ground during a fox hunt. Their small size allowed them to get in and out of fox dens easily. After the foxes were flushed from their dens hunters on horseback would resume the chase with their hounds. •	This Terrier is known for being courageous, intelligent and affectionate. •	Can be assertive but not known for being aggressive, quarrelsome or shy. •	Norwich Terriers are energetic and thrive on an active life. •	Love to eat, and always looking to find something to devour. •	Eager to please this Terrier, like most Terriers, have a definite mind of their own. •	Training must be fair, positive and not harsh. They are sensitive to negative actions and will shut down. •	They are an indoor dog and never be left outdoors or in a kennel situation. •	Not a ‘barker’, but great at letting you know if someone is arriving or at the door. •	This breed is good with children and other household pets if socialized with them properly. •	As a pursuer of vermin and working on farms, this breed needs healthy daily exercise. •	Norwich Terrier excel in dog sports such as Agility and Flyball competitions. •	They shed very little, a good choice for those with pet allergies. in the Spring. Otherwise usual professional grooming techniques work fine as well. For one, the Norwich Terrier is difficult to trust off of its leash or in an unsupervised environment. This is simply because the Norwich Terrier has historically been very, very good at what it was bred to do--which is to chase and hunt other animals. If let off its leash or let out of its yard or house, the Norwich Terrier will proceed to do exactly that. Training can alleviate this problem to a great extent, but basic drives can't be trained away--and this indelible aspect of the Norwich Terrier's personality may make the breed unattractive to some people who aren't comfortable with this particular flavor of terrier aggressiveness. The most serious Health Problems that can affect the Norwich Terrier are Epilepsy and a collection of respiratory ailments, prominently including narrow or collapsing tracheas. 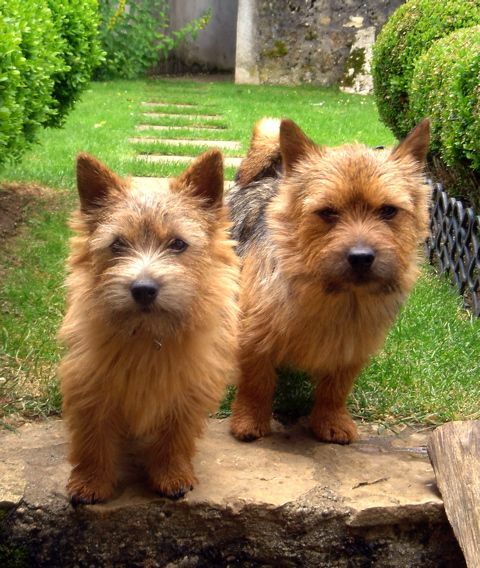 These conditions are both genetic, and young Norwich Terriers should be checked by a veterinarian regularly for early warning signs of these potentially very damaging problems. Apart from these conditions, the breed has a slight susceptibility to hip dysplasia, but otherwise good Health. The Norwich Terrier is a fairly low-maintenance dog. Some light brushing and combing should be done every week, with this schedule possibly increased during the brief shedding season. But overall, the size of the Norwich Terrier (and its comparatively indoor lifestyle) keeps the dogs from getting messy or matted enough for more than the occasional bath. One useful technique for keeping your Norwich Terrier clean, however--and one largely unique to this breed--is the practice of "stripping" your Norwich's fur every few weeks. Contrary to the implications of the word, this doesn't mean shaving your Norwich bald, but rather lightly pulling on dead hairs in the Norwich's outer coat in order to remove them prior to shedding. This keeps your house clean of dog hair, for one, but it also ensures that the growth of new hairs in the Norwich's coat won't be hampered by old, dead hair blocking crucial pores. Over time, careful use of "stripping" can prolong the life and health of your Norwich's coat, and it can also keep the coat tidier--reducing the number of times you'll have to do some clipping work in order to remove tangles or mats. "Stripping" the Norwich Terrier's coat should be the outer limit of grooming for this breed. For official purposes (showing or breeding), the Norwich Terrier's outer coat needs to be kept as natural as possible. Some trimming is of course acceptable--and probably desirable, even with the breed's low propensity to shed. But when grooming your Norwich Terrier, it's important to groom conservatively--keep the dog healthy and respectable-looking, of course, but don't alter its distinctive fur pattern. This is not only important for show purposes, but it's important for general health: most of the longer patches of fur on the Norwich Terrier's body are meant to protect it from the weather, and the tiny dogs may not do as well if this protection is denied to them in the name of ideas about fashion. Norwich Terriers, being energetic terriers, create most of their own exercise. As long as you're willing and able to give them the personal attention that they crave, Norwich Terriers can be kept in the home, lightly supervised, for some time without causing any destruction and while still getting a large measure of the exercise they need. To give them the rest of the exercise they need, however, you'll want to take your dog out for a walk once in a while. And again, as with many terriers, you'll need to take special care that your Norwich Terrier never gets off of his or her leash, and that good training and good habits ensure that your Norwich Terrier remains fairly close to you throughout his or her outing. Norwich Terriers are infamous for their ratting and mousing abilities, and an improperly trained Norwich Terrier will bolt at the first sight of rodents--including fairly common squirrels or other urban animals. So as the saying goes, keep your friends close and your enemies closer--and keep your Norwich Terrier closer still. It's certainly fine to let your Norwich Terrier play in a fenced yard--in fact, you should take as many opportunities as you can to allow this, as no dog, however indoors-friendly, can remain happy inside all day. Make sure, however, that the yard is fenced for exactly the same reasons as you should make sure that your Norwich Terrier doesn't get off its leash. Although chasing rodents is excellent exercise, you don't want to get any unwanted exercise yourself by chasing your Norwich Terrier through several neighboring yards at the end of the day. As far as individual play goes, Norwich Terriers enjoy tug-of-war games a great deal, especially with rope-style toys. Something about the ropes sparks that old ratting impulse in their minds, and the companionable temperament of the Norwich will enjoy playing with you, one of the beloved humans, more than any private game in an empty house or apartment. Don't be surprised, however, at the aggressiveness of your Norwich during games like this: all terriers tend to enjoy the company of people, but they also tend to enjoy winning and getting their own way. As long as overall behavior is good (i.e. no biting or unwanted barking during games), you can expect to see and tolerate quite a bit of aggressiveness on the dog's part--which is, after all, good exercise. Norwich Terriers are highly intelligent, and thus highly trainable--if you're willing to remember the central rule of training terriers, which is to recognize the fact that terriers invariably have their own will. Effective training of a terrier--even one as comparatively friendly and companionable as a Norwich Terrier--will require your learning how to turn that stubborn will to your own purposes by making it enjoyable and interesting for your dog to learn good behavior and respond quickly to commands. The way to do this is through positive training, never through negative/aversive training. Negative training will not allow you to turn a dog's will to your own purposes--not without breaking the spirit and personality of the dog, which is the principal joy of all terriers (and arguably the particular joy of the amiable Norwich.) Positive training, on the other hand, allows your dog to use his or her intelligence, to be rewarded for it, and to feel both pride and pleasure at the successful performance of a command or the successful following of good behavior--which leads to an increased willingness to perform and behave well, which leads to a well-trained dog.